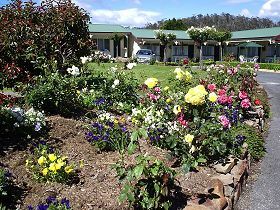 Apsley Holiday Unit provides self-contained accommodation on Tasmania’s stunning east coast at Bicheno. The unit is totally private with one bedroom. There is a fully equipped kitchen including microwave oven and refrigerator. 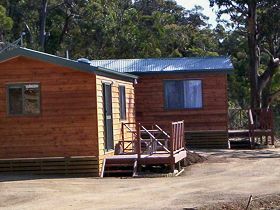 Guests have access to a washing machine and the bathroom has facilities for disabled guests. 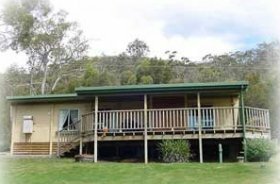 There is a living area with television and a pleasant verandah. 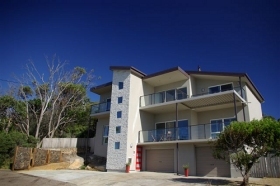 The unit is surrounded by two hectares (five acres) of lovely bushland overlooking the ocean. Wake to the sound of waves breaking and soak up the morning sun while having breakfast on the verandah. 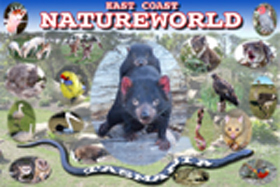 Centrally located to explore the east coast, drive a short 15-minutes’ and you will enter Douglas Apsley National Park. Camp near Leeaberra Falls at the park’s northern end or enjoy a four-hour return walk to Apsley Gorge. Freycinet National Park is also within short driving distance, where you will find magnificent Wineglass Bay. 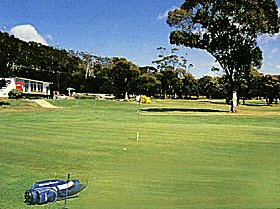 The Bicheno Golf Course is a short stroll from the unit and there are a number of restaurants to enjoy in Bicheno. Visit the east coast wineries or simply relax on your verandah and enjoy a barbecue. Bicheno is about two-hours’ drive southeast of Launceston (174 kilometres/108 miles).